The aquatic pattern of this Ocean Waves tarot bag illustrates white-tipped churning waves as they roll over an aquamarine and blue sea. It's ideal for decks with water-themed backside illustrations or individual card scenes that show waves and water in the background. This watery pattern is perfect for those who have an ocean deity as a patron or for those who communicate with water spirits. As the moon creates tidal forces, seas and oceans have always been connected (in the most literal sense) with the moon. By extension water is associated with women's mysteries, emotions, and intuition. 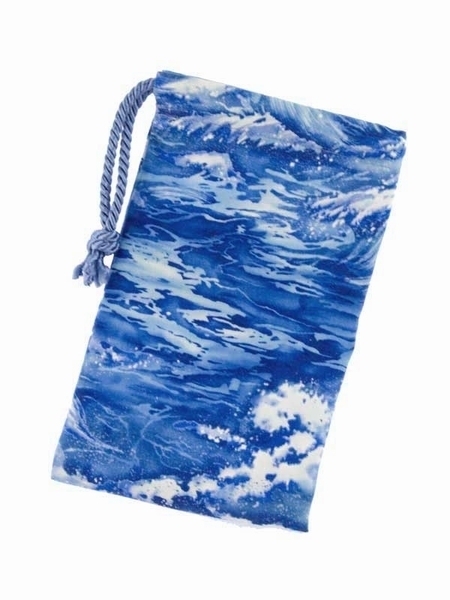 Give your tarot cards a psychic boost by storing them in this watery Ocean Waves bag! 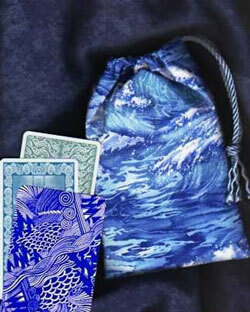 The photo below shows the bag with cards from three coordinating decks: Aquarian Tarot, Tarot of the Mermaids, and Tarot of Atlantis. The Arcus Arcanum and Tarot of the Pirates decks are also good matches. Size: Measures 5" wide by approx. 7-3/4" inches tall (12.7 x 19.7 cm). Fits most standard Tarot card decks (3" x 5" and smaller).